Nov. 28, 2018 — When Errett Peele Schmid ’60 attended Grinnell College, she did it with the help of a scholarship, along with a job as secretary for the history department. A history major, Schmid’s scholarship requirements were typical for the time: She had to maintain a 3.3 grade point average and she couldn’t have a car. Her husband, Jack Schmid, earned his economics degree from Hamline University in 1957. As high school valedictorian, he benefited from a Hamline presidential scholarship. The two met in graduate school at University of Minnesota, where Errett did graduate work in American studies and Jack studied labor and industrial relations. 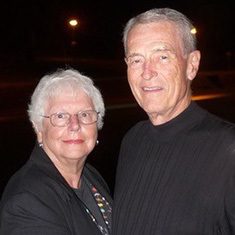 Married for 57 years, with two sons and two grandsons, the liberal arts graduates have established the Errett ’60 and Jack Schmid Endowed Scholarship at Grinnell through two charitable gift annuities and a bequest in their wills. They’ve pledged $175,000 to create this scholarship, which will be awarded to need-based students majoring in history. A charitable gift annuity, or CGA, is a planned gift to the College. Donors transfer cash or property to Grinnell in exchange for a partial tax deduction and a lifetime stream of annual income from the investment. The couple, who live in Mission Hills, Kansas, have also established the Jack and Errett Schmid Scholarship Fund at Hamline University, also using two CGAs and a bequest in their wills. “With both of us coming from small, liberal arts schools, we were mutually supportive of the two schools, so what we did for Grinnell, we did for Hamline,” explains Errett, who spent part of her career teaching history and later, working with her husband at his marketing firm. Now retired, Errett and Jack are actively involved in volunteer activities, mentoring small businesses and entrepreneurs in the Kansas City area. In the past, they have hosted Grinnell’s Kansas City summer picnic in their backyard, as well as attended and planned Reunion activities. Errett is not the only Grinnellian in her family to give back. Inspired by his sister, John Peele ’64, established a $25,000 charitable gift annuity to support the Pioneer Fund after selling his business in 2017. To learn more about the benefits of CGAs and other planned gifts, please contact Buddy Boulton, Grinnell College director of planned giving, at boultonb@grinnell.edu or 641-990-7128.